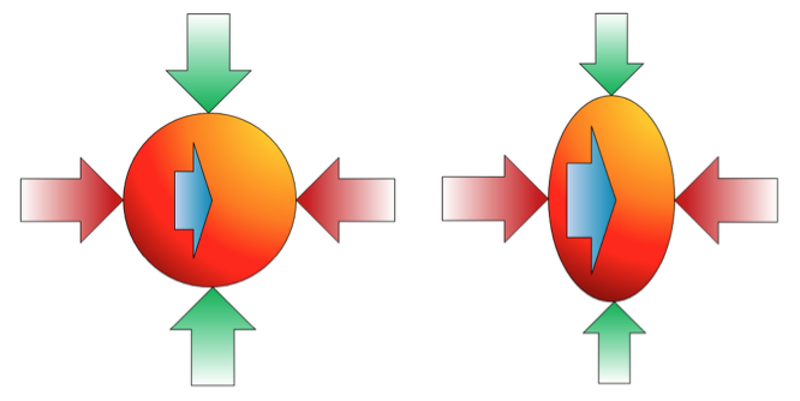 We can describe the stress applied to a rock by breaking it down into three dimensions—all at right angles to one-another (Figure 12.2). If the rock is subject only to the pressure of burial, the stresses in all three directions will likely be the same. If it is subject to both burial and tectonic forces, the pressures will be different in different directions. Rock can respond to stress in three ways: it can deform elastically, it can deform plastically, and it can break or fracture. 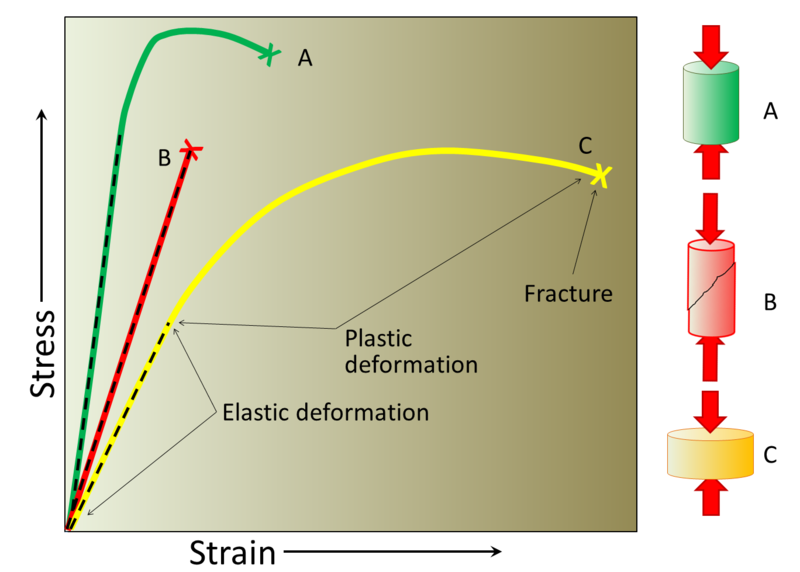 Elastic strain is reversible; if the stress is removed, the rock will return to its original shape just like a rubber band that is stretched and released. Plastic strain is not reversible. As already noted, different rocks at different temperatures will behave in different ways to stress. Higher temperatures lead to more plastic behaviour. Some rocks or sediments are also more plastic when they are wet. Another factor is the rate at which the stress is applied. If the stress is applied quickly (for example, because of an extraterrestrial impact or an earthquake), there will be an increased tendency for the rock to fracture. Some different types of strain response are illustrated in Figure 12.3. 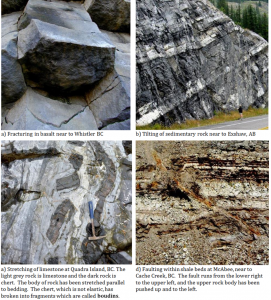 The outcomes of placing rock under stress are highly variable, but they include fracturing, tilting and folding, stretching and squeezing, and faulting. A fracture is a simple break that does not involve significant movement of the rock on either side. Fracturing is particularly common in volcanic rock, which shrinks as it cools. The basalt columns in Figure 12.4a are a good example of fracture. Beds are sometimes tilted by tectonic forces, as shown in Figure 12.4b, or folded as shown in Figure 12.1. When a body of rock is compressed in one direction it is typically extended (or stretched) in another. This is an important concept because some geological structures only form under compression, while others only form under tension. Most of the rock in Figure 12.4c is limestone, which is relatively easily deformed when heated. The dark rock is chert, which remains brittle. As the limestone stretched (parallel to the hammer handle) the brittle chert was forced to break into fragments to accommodate the change in shape of the body of rock. A fault is a rock boundary along which the rocks on either side have been displaced relative to each other (Figure 12.4d). 12.1 Stress and Strain by Steven Earle is licensed under a Creative Commons Attribution 4.0 International License, except where otherwise noted.